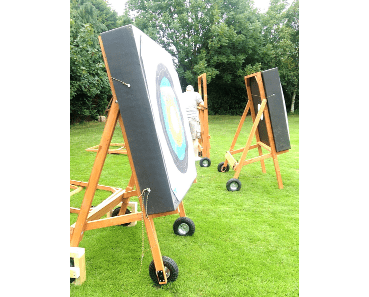 We are an independent family run business, based in Hampshire, set up to provide Archers with a dedicated, customer focused, target manufacturing service. 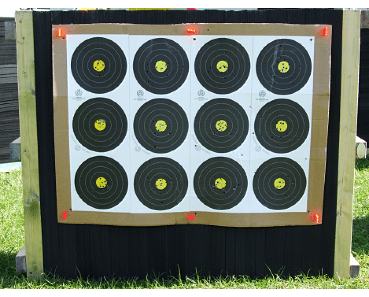 We manufacture quality self-pack targets that meet all of the requirements to satisfy both the pocket and impact of competition shooting. 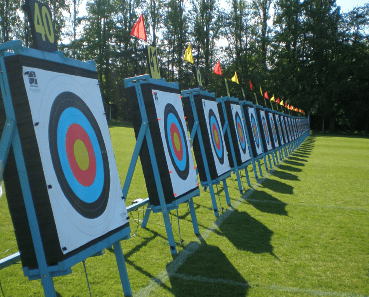 Tenzone Targets Ltd sell direct to individual archers and archery clubs. Our targets are World & UK record status tournament quality and have been utilised in many World & UK record status tournaments over the years. The stopping power and ease of drawing the arrow from the target makes our products suitable for all bow styles and age/gender categories. 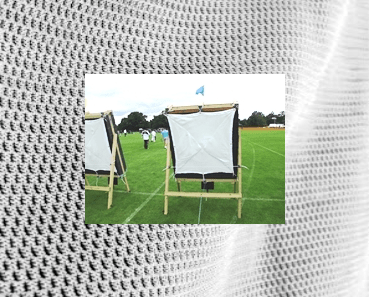 Our targets are manufactured in the UK and delivered fully assembled. ‘Self-pack’ refers to the users ability to repack the target without the need of banding equipment or presses. 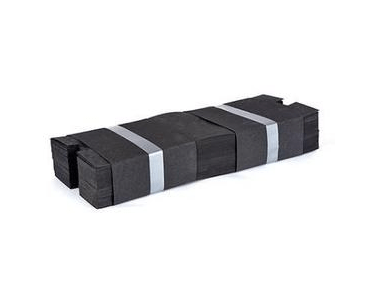 The ‘self-pack’ target is more expensive than the banded style of targets, however, the ability to replace the foam in minutes makes target maintenance far easier and more cost effective in the long term. 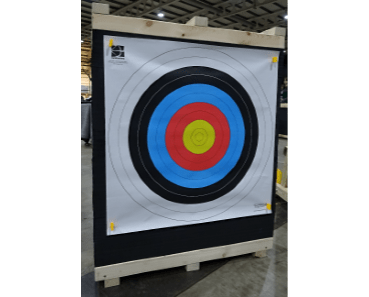 Tenzone Targets Ltd offer one of the most comprehensive selection of layered foam target designs available on the market; made to order. We are only restricted by the size of the material available and our imaginations. Looking for someting different? Give us a call to discuss your requirements. Replace foam sections with with ease & minimal tools. A 13mm spanner or ratchet & socket is all that is needed to rotate or replace the foam sections. 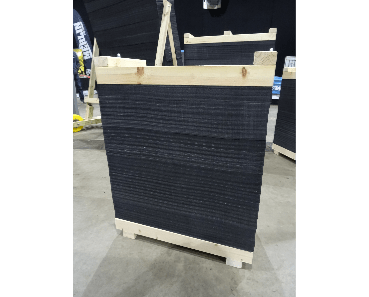 Replacement foam is available in 12cm sections (approx), for a cost effective durable solution to your individual, club and tournament needs. Personal or courier delivery options available. 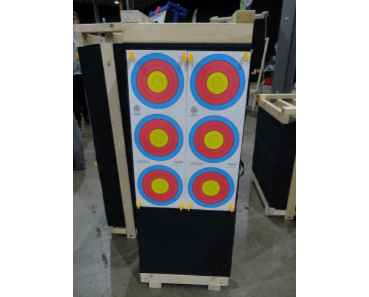 The cost of shipping a quantity of large archery targets can be a limiting factor when considering your purchase. 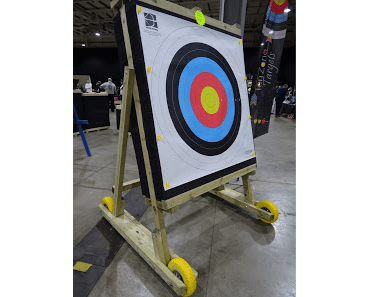 Tenzone Targets can offer either a courier delivery for smaller targets, or personal delivery in our own vans for a cost effective solution for larger targets. Browse our products section and complete yourself a wish list. Complete & submit the contact form including postcode for delivery. We will respond with a quote including the delivery charge. Accept the quote online, or ask any questions via the online portal. Your accepted quote generates a work order for our workshop. We will submit an invoice and contact you once your order is completed to arrange delivery. We are a small but effective team working at Tenzone Targets. When not in the workshop manufacturing your products we can be found delivering tournaments at the weekends. Keeping the team small helps us to maintain our competitive prices. We take great pride in our work and are selective regarding the material we use, this helps ensure we can produce a consistent, quality product. Used to help out in the workshop at weekends, whilst still at school, when we were starting the business. Now a full time employee. Target Technician, the workshop Slim Shady & master foam cutter. Younger brother to Sean; also used to help out in the workshop at weekends, whilst still at school, when we were starting the business. Now a full time employee. Thank you for all your support in getting Team UK to this year’s Invictus Games – we couldn’t have done it without you! Deer Park Archers the Sport 7 Recreation Alliance National Sports Club of the Year 2011 & the Archery GB Club of the Year 2012 only use Tenzone Foam Targets! We have trialled a range of manufacturers and suppliers with bosses costing up to 350 pounds and when considering quality, robustness, durability, reparability, value for money and sales service there was a clear winner. We would highly recommend them and indeed our County, Gloucestershire have come to the same conclusion! 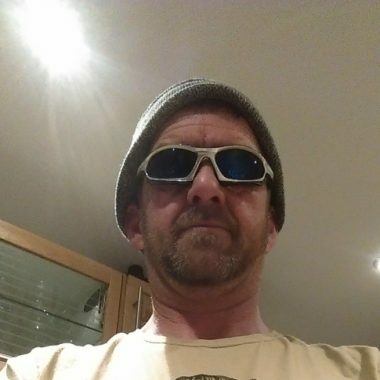 Just to let you know how impressed I am with the quality of your products. Very nicely built and excellent quality, a joy to use also. My clients also commented on the smart, professional appearance. Very much appreciated the customer service and contact from yourself and also the care taken to package the items etc. It all adds to the experience. Will not hesitate to pass on your details to clients and friends with a hearty recommendation. Many thanks for all the hard work by you and Luke over the weekend. 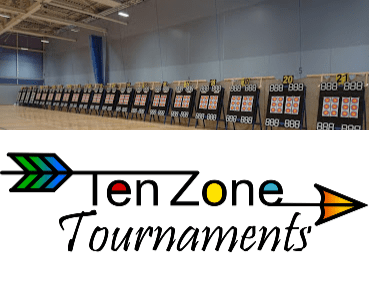 We would not have got this tournament to the standard it is now without the support from Tenzone over the last few years. You do not have to give us permission in order to use our website. This information is used to fulfill your enquiry and when required will be utilised to populate a secure customer contact database for the purpose of generating quotes and invoice billing. We use third parties to carry out certain activities on our behalf that involve the processing of personal information. For example, we may engage third party service providers to fulfil orders, deliver packages, send postal mail, SMS text messages and email, maintain and update our databases of customer details (including the removal of repetitive or incorrect information), analyse data to help us develop, provide and improve our services, provide marketing assistance, process payments and refunds, carry out surveys, provide customer service and handle claims. These third parties have access to personal information needed to perform their functions, but may not use it for other purposes. We may use the information we receive from third parties to supplement, improve and add to our databases of customer details, and for purposes such as credit checking and fraud prevention. We may pass personal information to external agencies and organisations (including the police and other law enforcement agencies) for the purpose of preventing and detecting fraud (including fraudulent transactions) and criminal activity. These external agencies may check the information we give them against public and private databases and may keep a record of such checks to use in future security checks. We may also disclose personal information to the police and other law enforcement authorities in connection with the prevention and detection of crime. We may pass your personal information to third parties if we are under a duty to disclose or share your personal information in order to comply with any legal obligation (including in connection with a court order), or in order to enforce or apply any agreements we have with or otherwise concerning you (including agreements between you and us (or one or more of our affiliates); or to protect our rights, property or safety or those of our customers, employees or other third parties. We are required by law to keep your personal information only for as long as is necessary for the purposes for which we are using it. The period for which we keep your personal information will be determined by a number of criteria, including the purposes for which we are using the information, the amount and sensitivity of the information, the potential risk from any unauthorised use or disclosure of the information, and our legal and regulatory obligations. Stop using your personal information to send you marketing materials such as our catalogue, marketing email, discounts or vouchers. Provide you with the personal information that you have provided to us, in a structured and commonly-used electronic format, or transmit that information directly to another company if that is technically feasible. This applies where we are using your personal information on the basis of your consent or because it is necessary to perform a contract with you (see How do we use your personal information, above). Our security procedures mean that we may request proof of identity before we are able to disclose your personal information to you or comply with other requests. We want to make sure that the personal information we hold about you and your preferences as to how we contact you are accurate and up to date. If any of the details are incorrect, please let us know (details below) and we will amend them. Please note that third party websites and applications are not under our control. When you click through to these websites or access these applications you leave the area controlled by us. We do not accept responsibility or liability for any issues arising in connection with the third party’s use of your data (including your personal information). Our website may use plugins from YouTube, which is operated by Google. The operator of the pages is YouTube LLC, 901 Cherry Ave., San Bruno, CA 94066, USA. The transmission of information via the internet is not completely secure; this risk is common across the internet and not specific to our services. We cannot guarantee the security of your data (including your personal information) transmitted to our services; any transmission is at your own risk. It is important for you to protect against unauthorised access to your password and to your computing device. Be sure to sign off and close your browser when you have finished your session. This will help to ensure that others do not access your personal information if you share your computing device or use a computing device in a public place such as a library or internet cafe. You can write to us at Customer Correspondence. Tenzone Targets Ltd. Haydown Mushroom Farm. East Cholderton. Andover. SP11 8LR. The Data Protection Officer can be contacted on enquiries@tenzonetargets.com, or you can write to them at the address above.